The Victorian conservatory roof is the most popular style of conservatory and it suits all styles of house and home whether it be a period property or a new build. 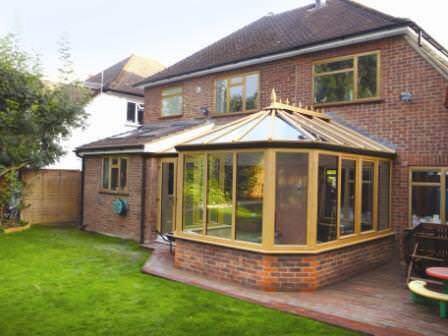 When people think of a conservatory it is the Victorian style that comes to most peoples minds. At Ultraframe, our Classic roof system gives your Victorian conservatory a distinguished and classical appearance. Your Victorian conservatory can also be configured in any design. It was the Victorian era in which the nation’s love of the conservatory blossomed. This was because of the Victorians’ love of foliage and exotic plants, which required a method of keeping plants alive during the cold winter months. In the 19th century, Victorian conservatory styles were created with ever-more-elaborate details to complement the period homes of the time. Victorian conservatory styles often included a Gothic shape to the windows and doors and complicated shapes in the roof, which was often steeply pitched, just like the roofs of Victorian houses. So, whether you want three or five facets, white or oak, your Ultraframe Victorian conservatory will look classic and elegant as well as being highly versatile and pleasing on the eye. At Ultraframe, all our Victorian conservatory styles are made to suit your needs. It’s your choice about the finish you have or the position of the doors.